The PEGAS Project Manager attended the 65th CITES Standing Committee meeting held in Geneva on July 7-11, representing Ol Pejeta Conservancy. 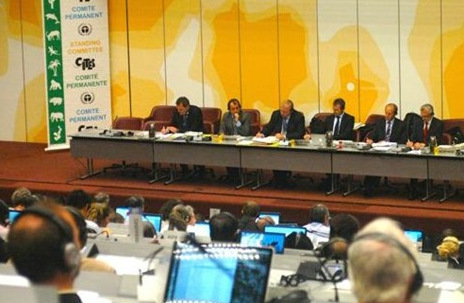 The CITES Standing Committee “…provides policy guidance to the Secretariat concerning the implementation of the Convention and oversees the management of the Secretariat’s budget. Beyond these key roles, it coordinates and oversees…the work of other committees and working groups; carries out tasks given to it by the Conference of the Parties; and drafts resolutions for consideration by the Conference of the Parties.” The Standing Committee also initiates action to suspend trade as a sanction against Parties (ie. countries) that egregiously break the rules. This was a particularly important Standing Committee meeting as there were several significant agenda items concerning various species and issues. Over 400 participants attended, the largest in history. As usual, most of the discussion was devoted to elephants, rhinos and big cats, with pangolins making a breakthrough as a big issue as well. Great apes languished in obscurity, as usual, although several NGOs and UNEP tried to bring more discussion to the floor. The CITES Secretariat, ably assisted by the Standing Committee chairman Øystein Størkersen, managed to prevent the requested formation of a Great Apes Working Group. Only through a working group could the evidence related to great ape trafficking be adequately examined and remedies proposed. The Secretariat continues to try to minimize the issue and thus avoid taking action. See Why are great apes treated like second-class species by CITES? and a PEGAS report addressing the issue for more details. The PEGAS Project Manager met and networked with many representatives of governments, the UN and NGOs, but attendance was principally a learning experience in how best to plan strategies to get something effective achieved in future with CITES for great apes. Plans are accordingly in the works for the 66th CITES Standing Committee meeting to be held in January 2016, followed by the crucial 17th CITES Conference of the Parties to be held later that year in South Africa. This entry was posted in CITES, CITES 17th Conference, PEGAS and tagged CITES, CITES 17th Conference, PEGAS. Bookmark the permalink.